Welcome to my blog for the last RemARKable Blog Tour of 2013. I've enjoyed participating in these fun tours and I hope you've enjoyed my projects! Once again, you've come from the very talented Anne Matasci's blog - Maui Stamper. Since Anne lives in Hawaii, I am really anxious to see just what she came up with for this month's stamp set - Best of Snow. Not much snow in Hawaii....but knowing Anne, she had some gorgeous art for you. The first card is the simple, but striking chalkboard effect. This would make a great Christmas card - if' you're still working on those - but I'm needing Thank You's right now, so that's what I did. It's a Naturals White card base with Basic Black cardstock. The image was heat embossed with Whisper White Craft Ink and White Embossing Powder. I then rubbed my Embossing Buddy over the surface of the cardstock to give it the chalkboard effect. 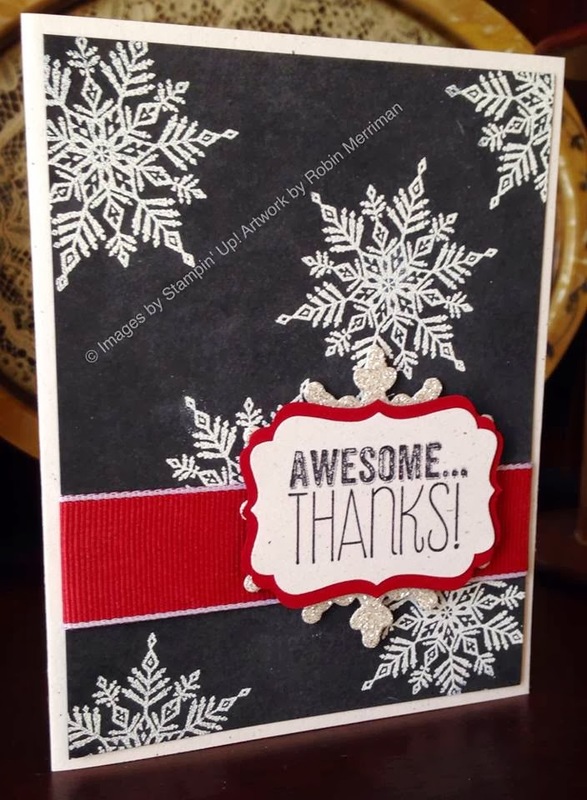 The greeting is from the Yippee - Skippee stamp set, stamped in Black Staz-On on Naturals White. I used the Decorative Label Punch for it and layered two Cherry Cobbler punches behind it to create a mat. It's mounted on a snowflake cut out with my Big Shot and the Festive Flurries Framelits ( say THAT three times, fast!) using Silver Glimmer Paper. All of that is mounted over a strip of the Cherry Cobbler Ribbon and easy-peasy, you're done! 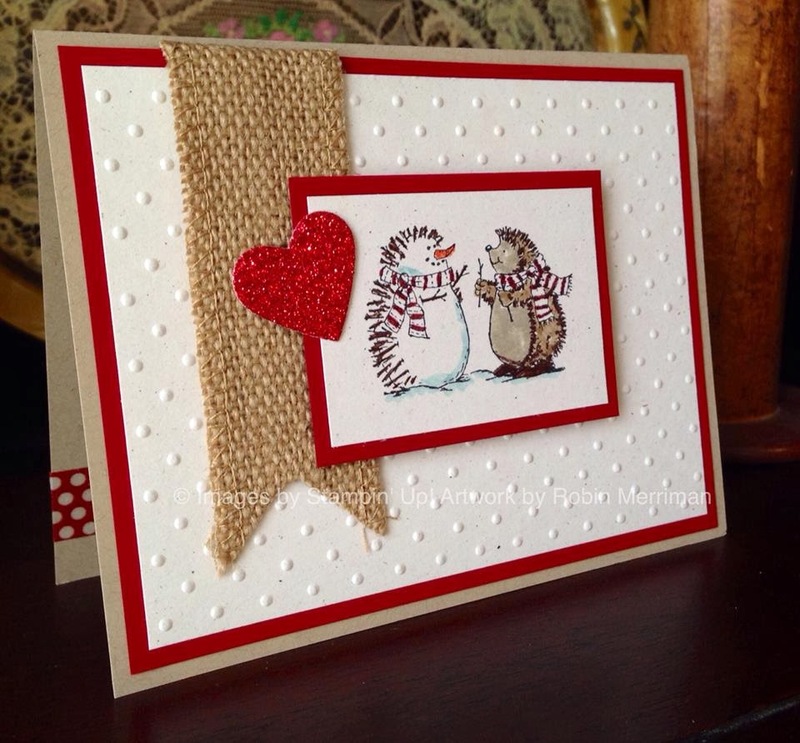 This cute hedgehog and his lovely, but chilly girlfriend just screamed Valentine's to me! So, I stamped them in Black Staz-On and colored them in with Stampin' Write Markers. It's Naturals Ivory cardstock mounted on Cherry Cobbler, which is the same color combo for the card itself. I added Crumb Cake for a card base and jazzed it up with a strip of Season of Style Washi Tape inside. The Red Glimmer Heart was cut out with the heart shape from the Thinlits Circle Card Die Set. I added a strip of Burlap Ribbon over the Naturals White cardstock that I embossed with the Polka Dot embossing folder. This card made my my daughter smile and that made me do the happy dance! I'm so glad you stopped by today to take a peek at my cards - I'll be back to regular blogging in January after the Christmas holiday. For now, be sure to click the tour graphic below to go to our next blog - AbsoluteKreations with Andi Potler. I know she has some awesome art for you! I love those! I am getting this set for Christmas, can't wait to start using it. Great cards Robin, love them!